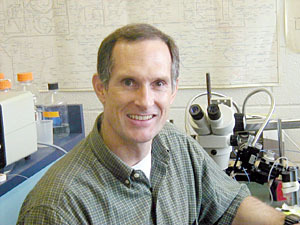 Home Faculty Bruce R. Stevens, Ph.D.
Research in the laboratory of Bruce R. Stevens centers on the plasma membrane transport of organic solutes and inorganic ions, and intermediary metabolism of these molecules by epithelial cells and brain cells. The cellular physiology, molecular biology, and regulation of transport and metabolism is pursued, along with the roles transporters play in regulating inflammatory events. There are five arenas of research currently under investigation in my lab. Gut microbiome and metabolomics of serious mental illnesses comorbid with medical disorders. Human clinical trials are currently under way. Autoimmune and neuroendocrine changes and intermediary metabolism of amino acid metabolism in splanchnic circulation affecting skeletal muscle function. We investigate the mechanism of certain combinations of amino acids and ketoacid derivatives of branched chain amino acids in enhancing human muscle function and performance. U.S. patent 6,100,287 was awarded for a portion of this work. Mechanisms of neuropathy in major mental illnesses. We study the effects of double-stranded RNA on innate immunity of brain cells, via TLR3 signaling in microglia and astrocytes. Using a model of inflammatory neuropathy of retroviruses, we utilize cultured brain microglia, astrocytes, neurons, and lymphocytes to uncover the role of dsRNA in brain cell signaling PKR, eIF2-alpha, NF-kB, and Nrf2 control of neural amino acid transporters (including monomeric isoforms, splice variants, and heterodimer subunits) as rate-limiting steps in gene expression of biosynthesis of glutathione, nitric oxide, amino acid neuromodulators, and triggering of cytokines. Pleiotropic roles of receptors for RNA virus in mammalian intestinal mucosal membranes, multifunctioning as host transporters of essential nutrient amino acids, as well as modulators of a gut renin-angiotensin-system. Our initial discoveries and characterization of mammalian intestinal sodium-dependent neutral amino acid transporters have subsequently led to understanding their dual role as cell surface receptors mediating the entry point of certain retroviruses. Additionally, our initially characterized intestinal transporter serving neurotransmitter amino acids, and another transport system serving glycine/proline, has led to understanding the role of intestinal epithelial membrane-bound angiotensin converting enzyme isoform modulating amino acid transport as well as forming multimers that serve as entry points for single stranded RNA viruses. Aedes aegypti cloning and site-directed mutagenesis functional characterization of amino acid transporter genes as targets for novel insecticides to mitigate mosquito-vector Zika, West Nile, Yellow Fever, and Malaria. We were awarded US Patents 7,181,884 and 6,766,613 for work leading to the invention of an environmentally friendly insecticide that targets the CAATCH1 protein expressed in the gut digestive epithelium of pest insect larvae. We cloned the first gene encoding the multifunction protein CAATCH1 which is a proline transporter yet also functions independently as an amino acid ligand-gated cation channel. We are pursuing two novel properties of this protein, namely proline and sodium movements that are thermodynamic uncoupled, yet certain other amino acids gate ion charge movements. We have generated site-directed mutants of CAATCH1 to explore the molecular mechanism of the expressed proteins in Xenopus oocyte membranes. Our findings using radiotracer amino acid uptake, in conjunction with steady state and pre-steady state transient current electrophysiology, suggest that the mechanism by which a narrow range of nutrient amino acids inhibit the CAATCH1 protein ion channel activity behaves much like pharmacologic inhibition of current in the human dopamine transporter. Also, we have created GFP/CAATCH1 chimera expression vectors which have been successfully expressed in HeLa cells, and in conjunction with the technique of radiation inactivation by a 13‑MeV linear accelerator at the NIH we are embarking on examining the molecular arrangement and interactions among membrane‑bound proteins/subunits of transporter proteins.